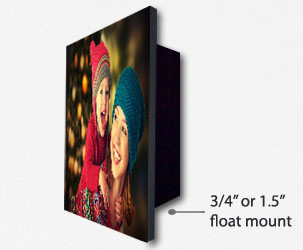 Museum quality fine art canvas are perfectly mounted on the high grade aluminum, a very rigid, durable, and lightweight board that will not warp. Sintra® is the trusted brand leader by which all others are measured for more than 20 years. Sintra pvc board is the lightweight yet rigid and durable with a low gloss matte finish. Canvas on Sintra pvc board is the choice for high quality mounting prints where light weight, rigidity and warp resistance are a must. Choose from white and black Sintra pvc boards. This Sintra pvc board mounted print is ready to hang with a high density polyethylene hanger included. Canvas on Sintra pvc Board uses the same museum quality canvas as our standard and gallery wrap. Museum quality canvas is perfectly mounted on a high quality 3 mm black or white Sintra pvc board. We apply the fine art UV coating on the canvas to provide additional museum level archival protection against color fading, moisture and abrasion. Your canvas on Sintra pvc board is hang extended from the wall with the appearance of floating. The float mount is built from high grade pvc block with keyhole slot. 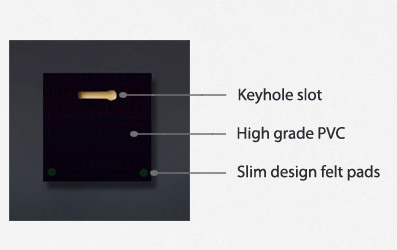 Two slim design felt pads are included with the float mount block. We can do any canvas on Sintra pvc board size.